Boston Bloggers: Boston Bloggers Holiday Meet-up | Tuesday, December 4th! 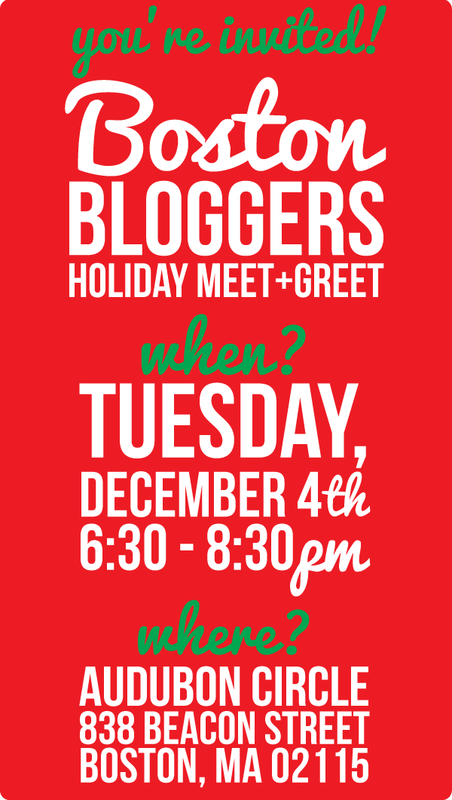 Boston Bloggers Holiday Meet-up | Tuesday, December 4th! Kate and Alison are happy to announce this year's holiday Boston Bloggers event! This meet + greet will be held at Audubon Circle on Tuesday, December 4th from 6:30 to 8:30pm. We hope you can make it! If last year was any indication, tickets will sell out to this event, so be sure to get yours soon. We will be collecting new, unwrapped toys for donation for the Salvation Army holiday efforts. Note: donation is not required; we just wanted to make it available so the Boston Bloggers can help bring cheer to children in need! Please note: We cannot offer refunds. If you cannot attend, please alert us so we can free up your space on the guest list. This is such a big and most awaited event in Boston! Thanks!